GRANBY – A school-wide read aloud has brought the Granby Elementary School community together social and academically. 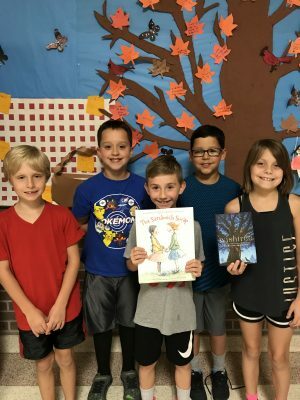 From left, third graders Nicholas Goss, Jaxson Allen, Tanner Bryerton, Lucas Hammond and Jayde DeRycke proudly stand in front of the school’s wish tree and picnic bulletin board where all Granby students, family members and teachers have been invited to write down their wishes or acts of kindness. Library media specialist Allison Earl said the inaugural effort has provided each classroom in grades three through six a copy of “Wishtree” by Katherine Applegate and classrooms in Universal Pre-Kindergarten through grade two a copy of “The Sandwich Swap” by Queen Raina of Jordan Al Abdullah and Kelly DiPucchio. Both books showcase themes of tolerance, empathy and friendship, all of which perfectly mesh with the Fulton City School District’s social-emotional learning initiatives. Earl said each classroom teacher may read sections of their class books during designated social-emotional learning time, or of another time of their choosing. The read aloud began Sept. 17 and will continue throughout the first marking period. Small activities will tie into the books’ themes. The most noticeable one is a large wish tree and picnic bulletin board where students, staff members and family members may write their wishes or acts of kindness. The idea, Earl said, is to have that collaborative, caring culture spread throughout the school year. “We just wanted a great way to kick-off the school year,” Earl said. Those classroom books will become a part of the library’s collection after the read aloud is complete, so students will have an opportunity to read them individually. The school’s Parent Teacher Group also donated four copies of each book, which were recently distributed to students during a special assembly.